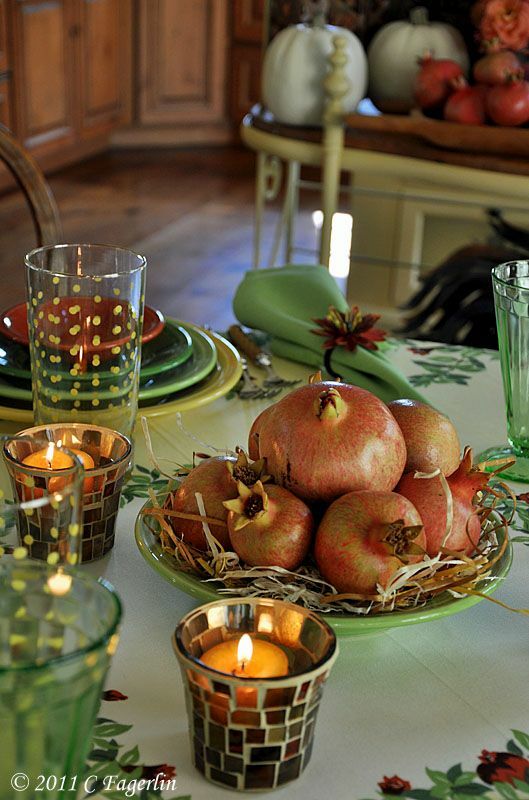 I pulled out my vintage California Hand Prints "Pomegranate" tablecloth and set a tribute to this aspect of the Fall harvest here in California. 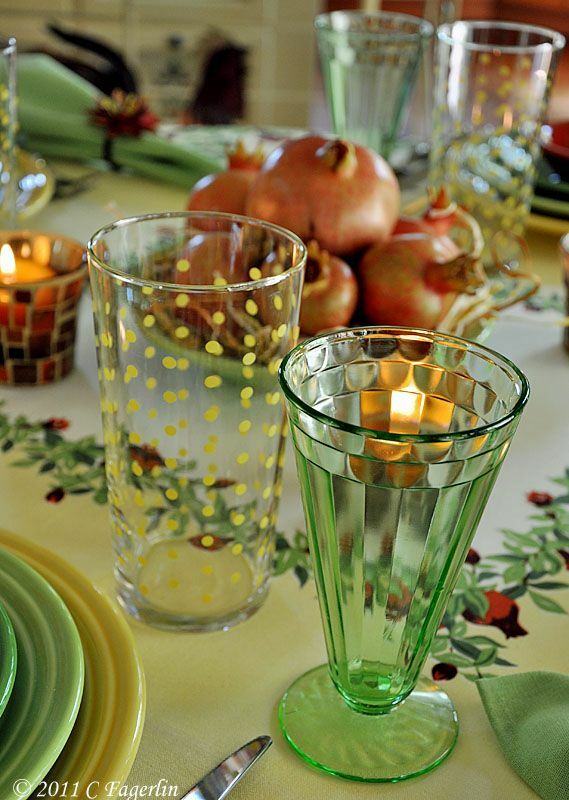 The green Depression Glass is vintage too, while all other elements are contemporary. 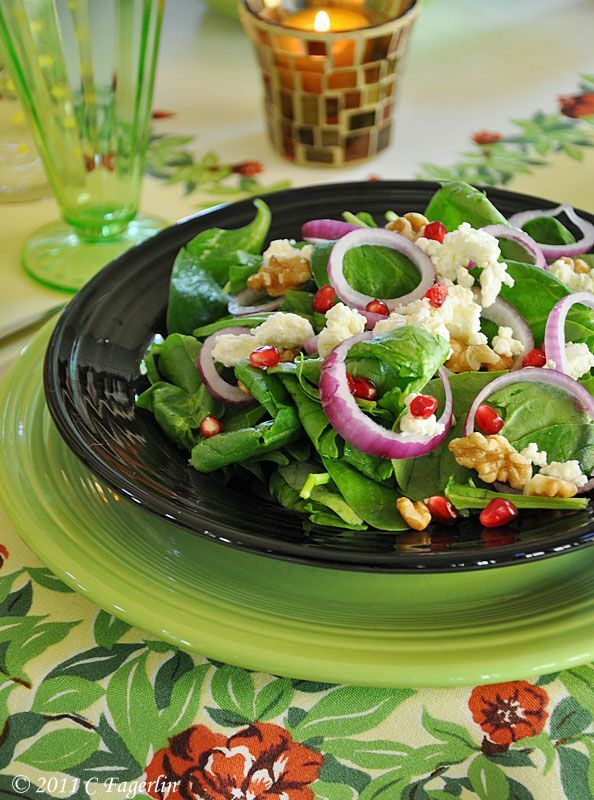 I love this salad and look how great it looks in a black Fiesta flat soup bowl. Glad to see you are doing some tablescapes. Life does go on after a crisis. Bless you and your sweetheart. Hope everything is going well. I have a pomegranate tree also. I will be making jelly for Christmas gifts this year. YUM!! I love Pomgranates and your bush looks edenic to me. And you did not only a table with pomgrante theme but also a matching menue. Oh my, this is so delicious. Thank you so much for this wonderful table. Hi Candy, I envy you California ladies and your fruit trees. 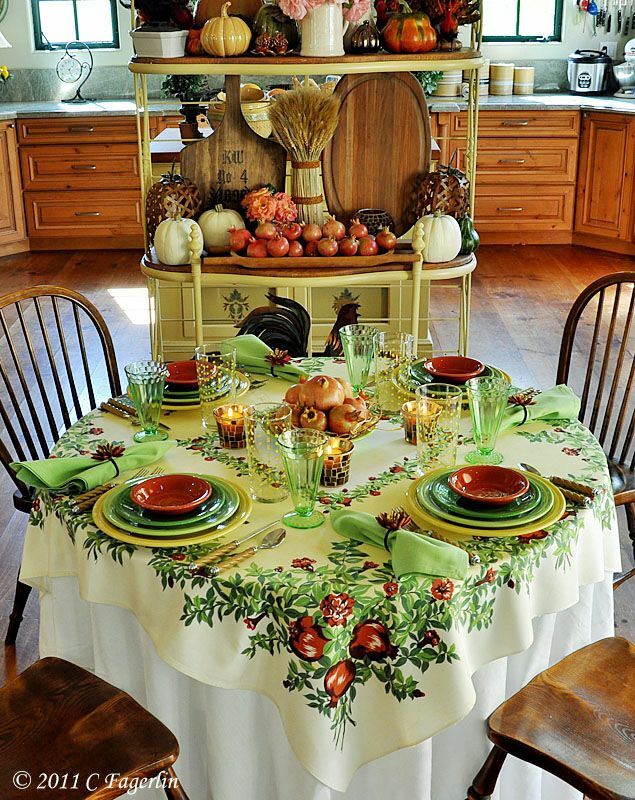 I love the tablecloth and the display behind the table is beautiful. I make this same salad but I have to get my Pomgranates from the grocery store. Thanks for sharing another pretty table at the Open House Party. 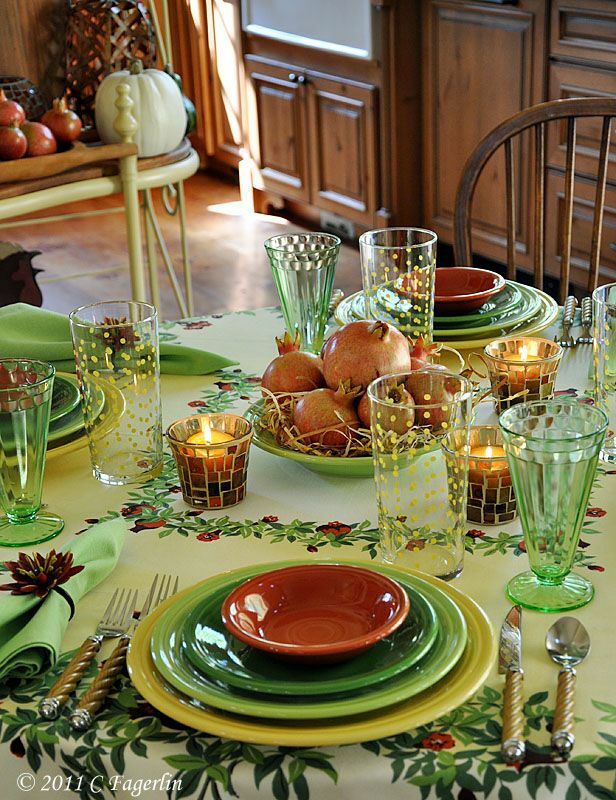 The glassware really brightens this tablescape. Everything is so fresh and charming. 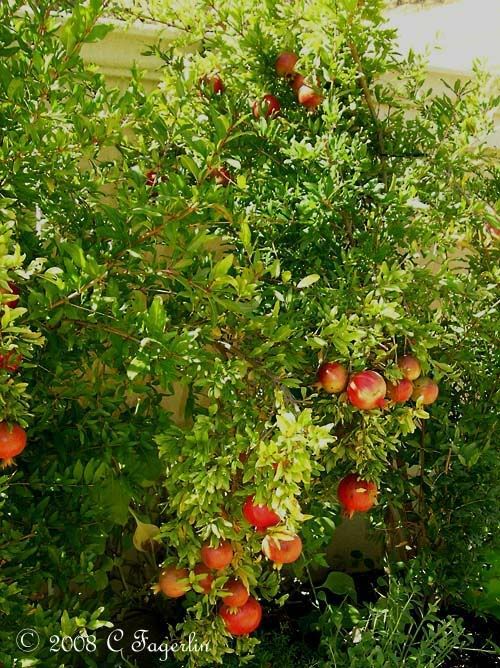 Candy, how wonderful to have your own pomegranate tree. 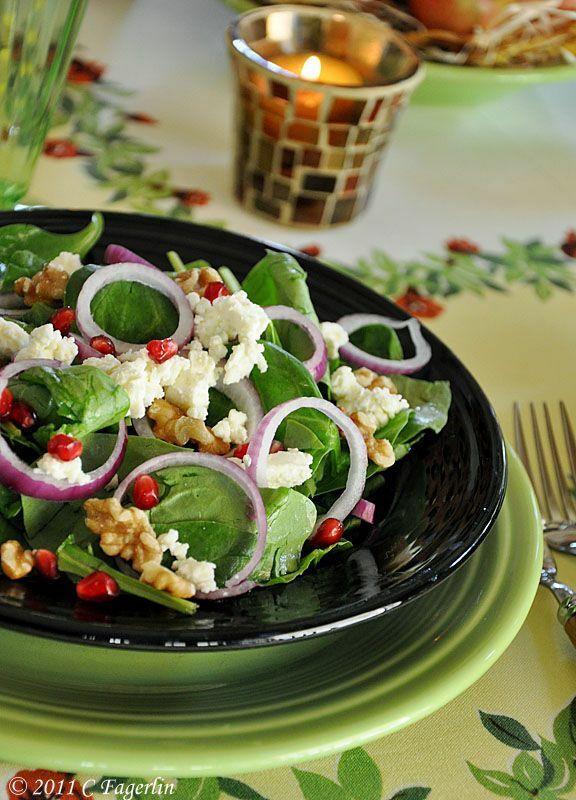 I like to use the pomegranate seeds on salads. Adds a wonderful touch! I love the setting. I would love to sit at your table and have some of the yummy salad. Hi Candy. 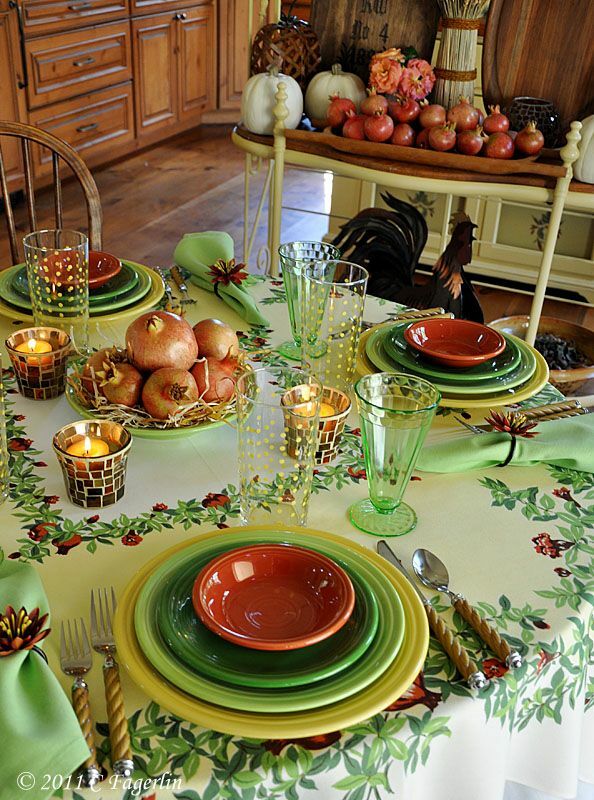 Your tablescape is a lovely tribute to the healthy and delicious fruit. Nature did a lovely job all on its own! It all looks great. I'm stil loving the bakers rack. Thanks for the link on how to seed a pomegranate. The polka-dot glasses are so cute. I love how you mixed them with the green ones. 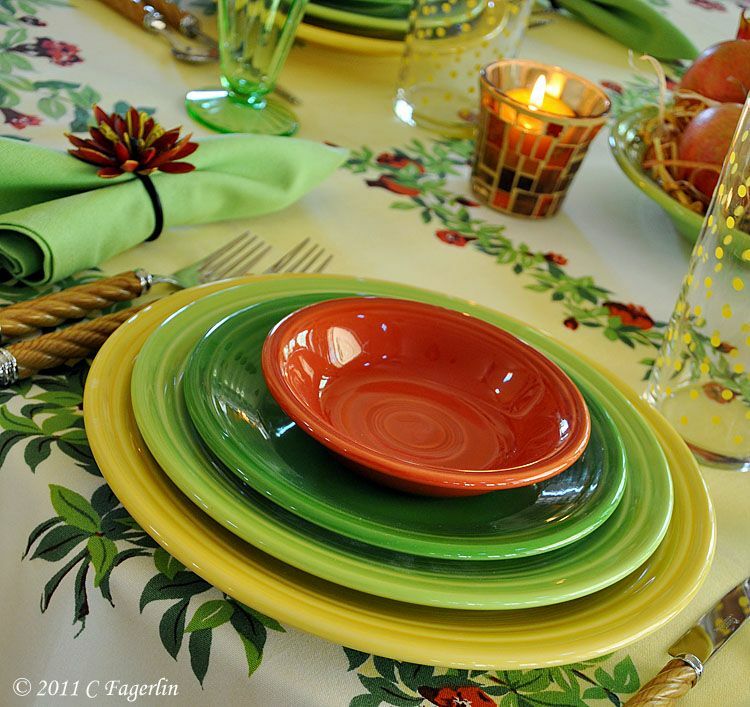 This is just a beautiful tablesetting! Your linens always look so crisp. Your color combinations are stunning! Thank you for the recipe too! Candy, this is sooo pretty! 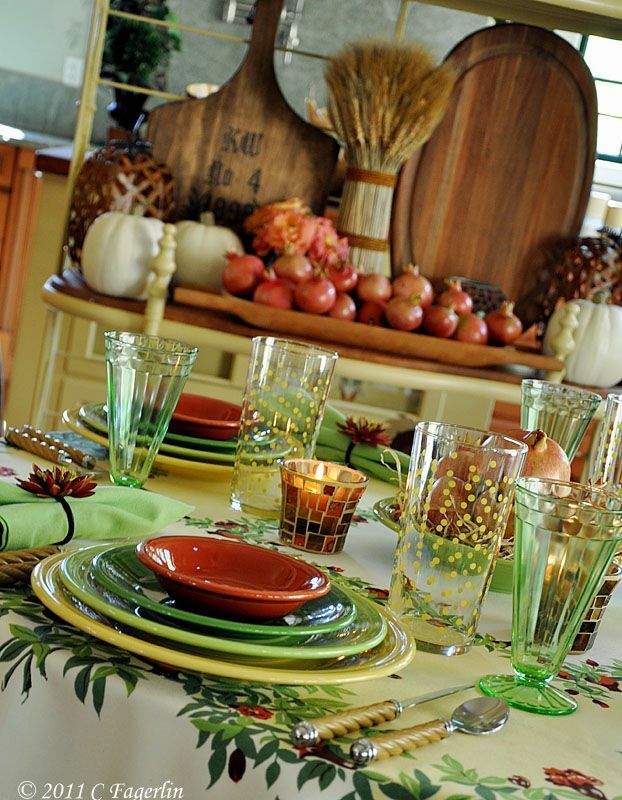 Love your fiesta ware and your lovely vintage glassware. 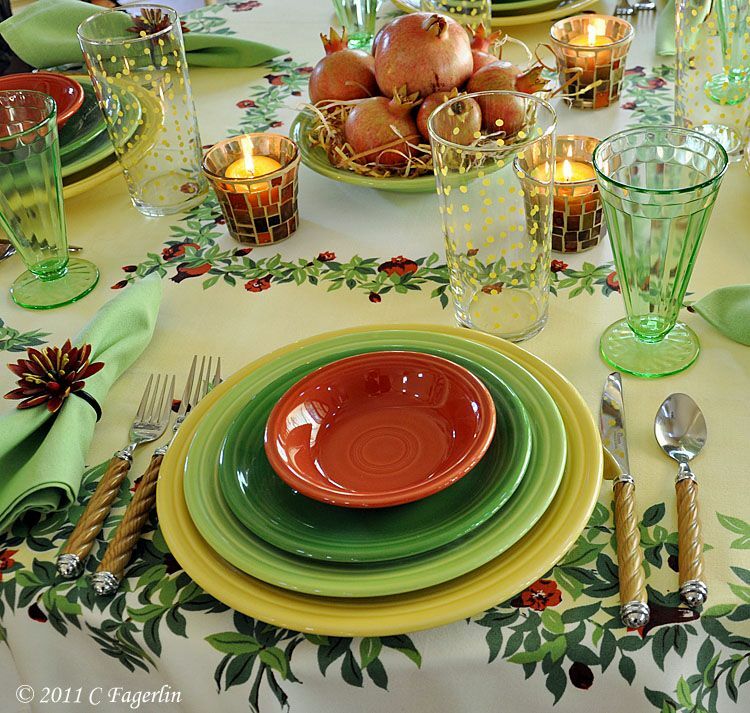 My son is getting married next May and his sweet bride has chosen Fiestaware for her everyday. I sent her a link to your blog several months ago so she could see your beautiful collection. How beautiful -- I will have to try the pomegranate salad -- It's as lovely as your table....well almost. 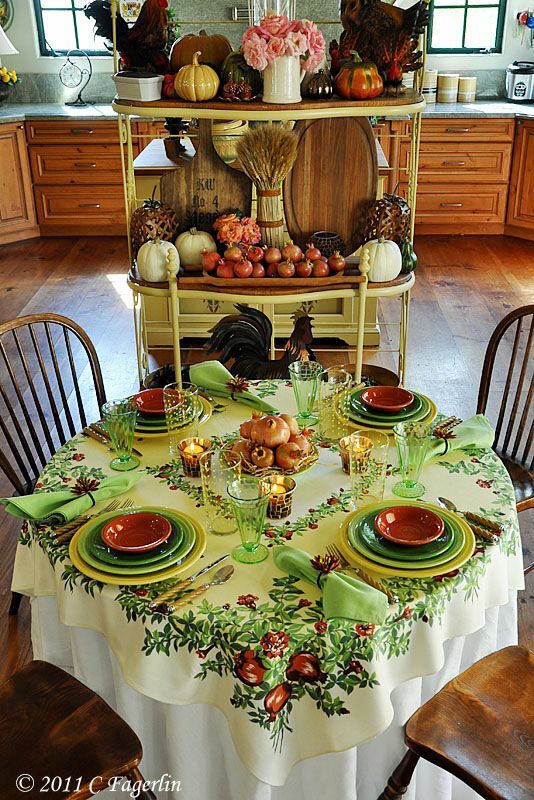 I love this table...the colors are gorgeous and it's so much fun to see all of your tablecloths each week. Your color sense is just stunning! How wonderful to have pomegranates at your finger tips! Your tablescape is lovely from the table covering on up. 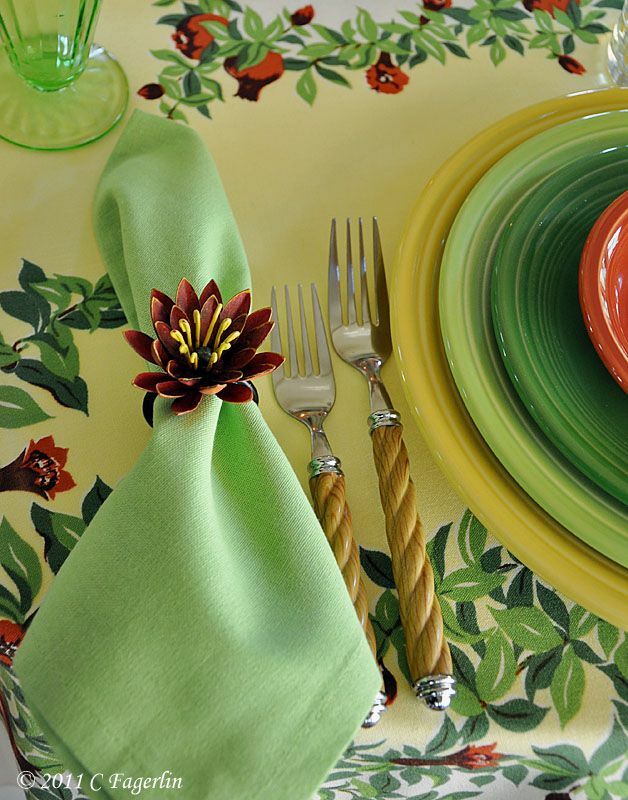 The napkin rings are perfect and I like the flatware, too. Your salad looks so refreshing and the recipe sounds so good. I hope to give this a try soon! Love your Pom theme! That sald looks really good too. 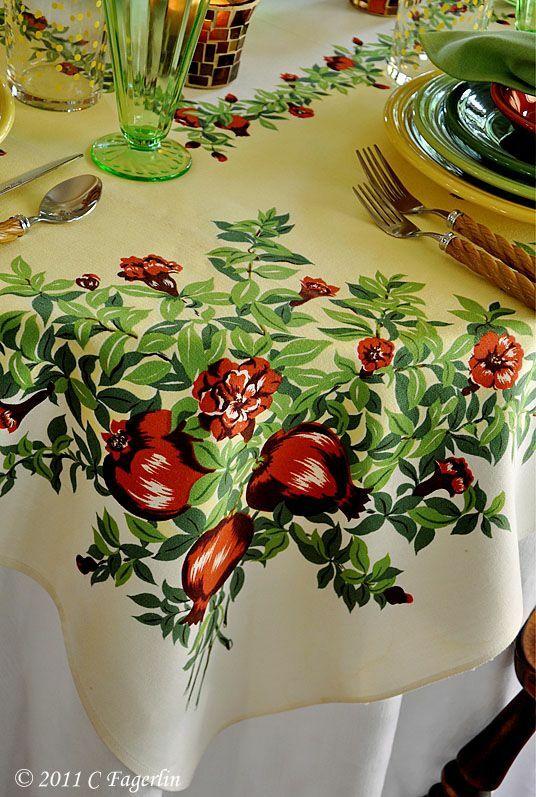 How do you get your vintage tablecloths to look like they are brand new? Starch? I find ones in thrift stores and when I inspect them they always seem to have a spot or yellowing. Is that usually permanent? I'm just now catching up on blogs... this one made me smile a lot. 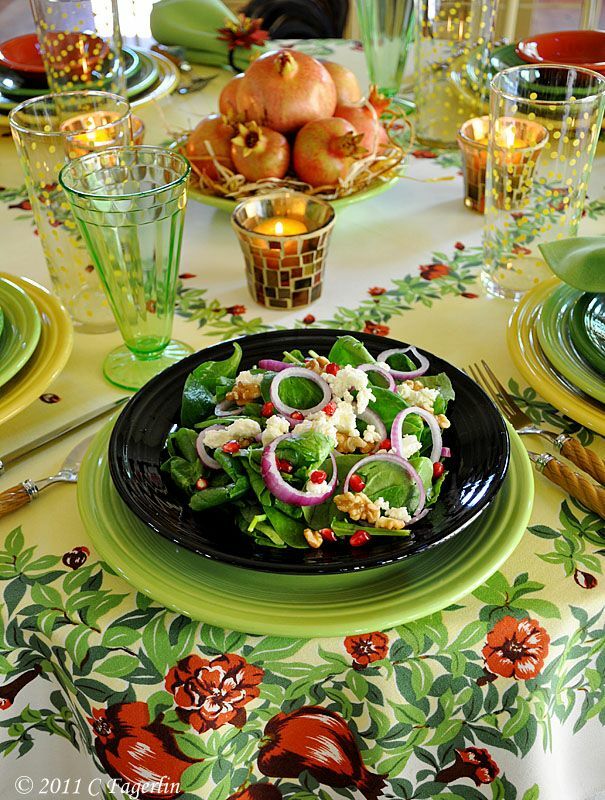 The color combo is just perfect, the salad looks yummy, and I really love this mix of glassware. 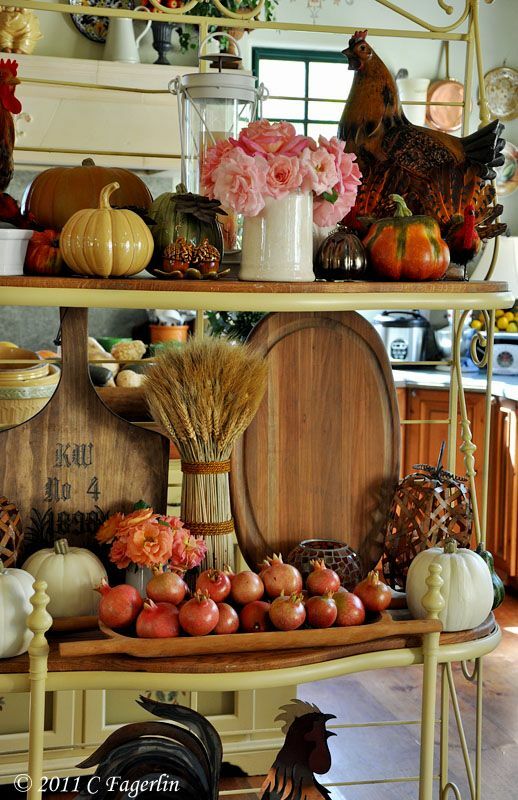 I wish Becky could see this tablescape---how she loved that Pom cloth!